Spin the reels for a chance to play the incredible bonus round, where you are transported to treacherous hotspots around the globe. Shoot down as many soldiers as possible to win free games and cash prizes. Play up to 25 lines, and win up to 5,000 times your bet. The only duty you’re called for in this combat is to reel in that winning spin and with new weapons and technology you’re bound to succeed! • Select your bet by clicking on the arrows in the ‘Bet’ field. • Select how many lines you would like to play with by clicking on the arrows in the ‘Lines’ field. • Click ‘Spin’ to begin. • Click ‘Max Lines’ to select all lines and play. • This video slot has 25 paylines. • Soldier symbol substitutes for all except for Scatter Logo. • 5 Soldier Substitute symbols multiply your bet by 5,000. • Winning combinations pay from left to right except for Scatter Logo, which pays any. • The prize is doubled when Soldier Substitute is in the winning combination. • 3 or more Scatter Logo symbols trigger The Call of Duty 4 feature. 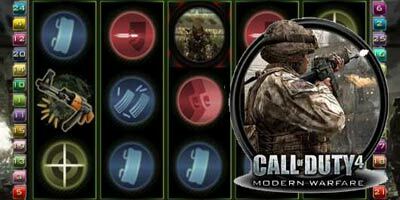 • Win free games with up to 5X multiplier during The Call of Duty 4 feature. • Win up to 4 free games for every soldier hit with a bonus prize for headshots. • Receive bonus points for destroying cars and barrels. • You can use the Autoplay option to have the computer spin for you. Just click on the Autoplay button at the bottom right, select the number of spins and click on the Spin button. You can stop Autoplay at any time. Autoplay pauses for bonus rounds and free spins. o A five-in-a-row kill streak awards an Airstrike. "Call of Duty 4 * How to Play * 5 Pound free"